The Sketchy tool adds extra shading to your strokes producing a "sketchy" look to even very simple drawings. With just a small number of strokes you can quickly make much more detailed appearing sketches. Here are a few example sketches made primarily with the Sketchy tool. The Fall off setting controls how much extra shading is added. With 0 fall off there is lots of extra shading added to your strokes. With maximum fall off there is very little added. 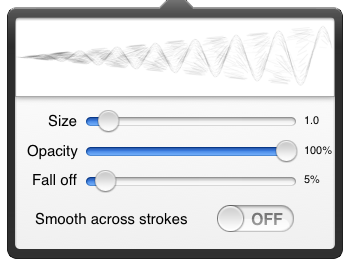 The Smooth across strokes setting determines whether is shading is added between all strokes or only to the current stroke. The Sketchy tool is based on the online drawing experiments Harmony by mr doob and scribbler by zefrank.